Public Swimming at an Onondaga Lake Beach? How Feasible & How Desirable is it? 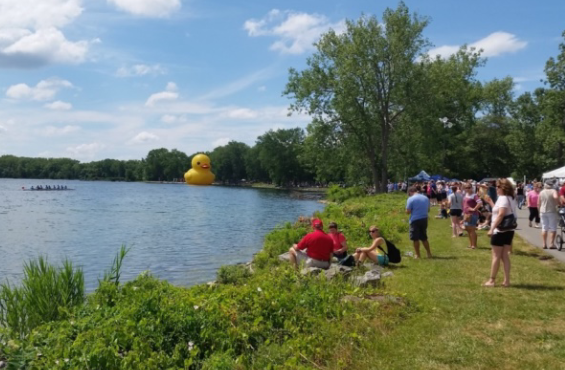 People at Onondaga Lake Park for boating event. Would residents use a beach on the lake? Onondaga County is looking to residents for help in determining the feasibility of a beach and swimming area on Onondaga Lake. The county is using grant money to conduct an in-depth study using public input gathered through surveys, and from meetings like one being held tomorrow evening at Destiny USA. A public meeting will take place on Tuesday to discuss the possibility of a beach on Onondaga Lake. Director of community engagement at FOCUS Greater Syracuse Frank Moses says past studies have shown an interest in swimming. Moses says a more recent survey showed swimming ranked 5th as “very desirable” out of 16 activities on the lake. Director of the county’s Office of Environment Travis Glazier says now they have to look at the practical implications of this type of waterfront development. "Are there infrastructure constraints that would need to be taken into consideration? What would the cost be to put that in there? What sort of operations and maintenance considerations in the long term investment would the county have to go through?" The county has hired engineering firm Barton and Loguidice to conduct the study. Glazier says they’re looking at an area along the northeast shoreline from the Butterfly Garden off Onondaga Lake Parkway to the Seneca Outlet in the Park. "Is there access via roadway or parking? What is the wave action like there? Is this a really choppy area or is this a cover? Is this too constrained? There are certain areas where it's very thin, it's very close to the trail and you want to have separation from the trail." Glazier says the design may or may not include a bath house, depending on need, size, infrastructure, and cost. The study will also conduct a market analysis of beach-related assets in the area, and proximity to each. Meanwhile, he knows there’s still a lot of skepticism about water conditions, even 20 years and three quarters of a billion dollars after cleanup began. "This is yet another opportunity for us to engage and to hopefully help people understand that progress has been made, that water quality is in line with other water bodies; even better than other water bodies." Glazier says the goal is to have the feasibility study completed by year’s end, at which time it will be presented to lawmakers. Until then, he says there will be a number of outreach efforts. Tuesday evening’s meeting runs from 5 to 7 p.m. on the Destiny USA Skydeck, with a presentation at 5:30. Central New Yorkers have a chance this weekend to see up-close some of the latest changes to 90 acres of restored wetlands around Onondaga Lake. The free event put on by Onondaga Lake Conservation Corps aims to help restore the bond between the lake and the community. Central New Yorkers will have the chance to explore the improvements to the Onondaga Lake shoreline this weekend. Lots of people have opinions about health of Onondaga Lake and recreation around it. An update today from Onondaga County and Honeywell, hosted by FOCUS Greater Syracuse, shows that a number of projects addressing both concerns are moving right along. Onondaga Lake remediation continues as more recreation activities are added around the lake. The public will get to hear more details this week about the next phase of remediation to Onondaga Lake along the southwest portion of the lake and where the County plans to extend biking and hiking trails. Onondaga Nation's Environmental Attorney is skeptical of the next stage in the clean up of Onondaga Lake. FOCUS Greater Syracuse’s latest Wisdom Keeper was honored for telling the story of the soul of Syracuse. Columnist Sean Kirst was honored by the group Wednesday night.